Nothing says `Xmas` more than a real fir tree! 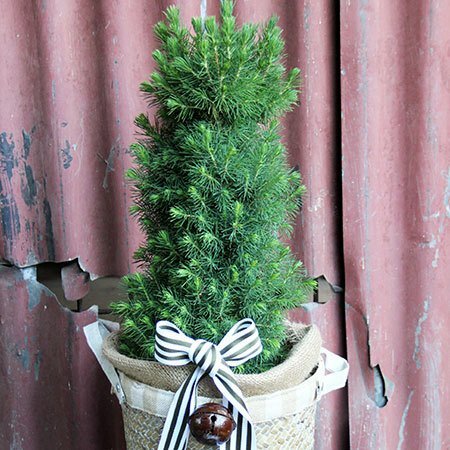 Ideal for office gifts or to grace the living room of a city apartment or home, our mini Xmas trees in a stylish sea-grass style basket is the answer to your `what am I going to buy everyone for Xmas?` prayers. 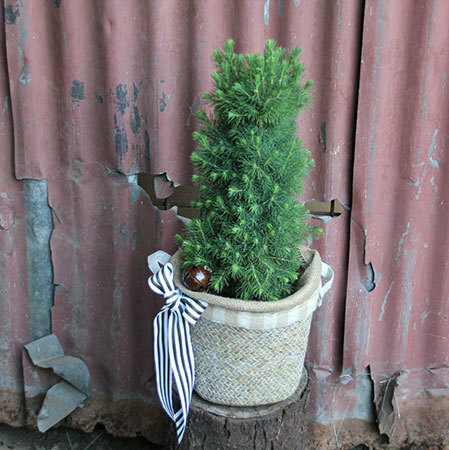 Order our mini Xmas trees via our online florist shop or give the team a call on 1800 66 66 46. Adorned with a rustic Xmas bell and bow, this gift is perfect on its own or teamed with a bottle of sparkling, chocolates or one of our quality Ecoya candles. PLEASE NOTE: The pictured Xmas tree and price is available for delivery in the Sydney Metro Region only. For custom orders outside Sydney, please ENQUIRE DIRECTLY on 1800 66 66 46 or email sales@flowersforeveryone.com.au Our fabulous team can provide advice and a quote to place your order via an affiliate florist network. 2016-12-18 Service rating : Thank you everything was as ordered. I would have paid more if there was a place in order to upgrade and decorate the tree. 2016-12-02 I ordered a Christmas Tree on 25 Nov & told not in stock. Even after I was told they would get one, three days later, still no stock.